One Saturday afternoon in January David Hall received a phone call from Maldwyn Lewis, a Funeral Director in Rhydlewis in West Wales near the coast south-west of New Quay. Maldwyn had four Brothers with him and he requested a price for a Saturday afternoon funeral. As normal David did his due diligence before working out the price, taking into account the mileage, fuel and accommodation costs. Whilst Maldwyn was waiting with the four Brothers for David to return his call, he counselled them that running a vintage lorry wasn’t cheap, he knew because he was also a part owner in a local Coach Company. Maldwyn gave the Brothers what he thought would be the likely cost, however, everyone was pleasantly surprised when David’s price was almost 30% less than Maldwyn had suggested from his experience in the funeral industry. The week before the funeral Maldwyn told David that a TV Company would like to film the funeral and interview him for a forthcoming BBC Wales TV programme. David spoke to Geraint Rhys Jones of GRJ Media and he was assured that the filming would be discreet and would be part of a dignified programme. Given the funeral was in January with snow and heavy frosts predicted, David contacted Steve Hunt, an HGV Driver, whose family had used the 1950 Leyland Beaver on two occasions, to provide information which can determined which route David will take. Steve told David that although the A40 through Brecon is gritted the incidence of snow on the high ground should dictate the use of the A48. ‘Keep to the coast Dave,’ was Steve’s final word. Previously David had telephoned Pyle Garden Centre to enquire whether he could use their café and toilet facilities at around 1100 hours, however, the Leyland Beaver made better time than expected and David was outside at 0845 hours keen to use the toilet and café, in that order, when the site opened for business. The A48 road comes to an abrupt end in Briton Ferry with vehicles being forced onto the M4, where vehicles were moving at speed overhead, or to take the A483 into Swansea and then out again on this road before rejoining the A48 at Penllergaer. David went through Pontarddulais and for the next 10 miles the A48 runs alongside the M4 before the two roads merge into the A48 after Pont Abraham Services. Maldwyn took David to meet Huw Davies, one of the Brothers, who said ‘We heard that you were on your way past Carmarthen, we got a text from someone visiting the hospital’. Huw was concerned when he found out that David was intending to drive home after the funeral and he offered to pay for the extra cost in the hotel for David to stay a second night. However, David was confident that he could get home within the 15 hours shift, which is the maximum working day for a current HGV Driver. David spent the morning with Maldwyn and his wife Carys Ann at their home which is above their funeral offices. Carys explained that she was the Church Minister for 7 churches in the locality, handling 4 services at specific intervals one Sunday and three the next. 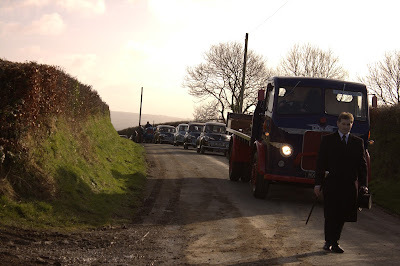 She also explained that she would be conducting the service for the Deceased who David would be carrying on his lorry and that the service would in Welsh and English and she would not make the English a direct literal translation because that would bore those who spoke both languages. David told Carys Ann that the difficulties she had to endure made his 15 hour day seem like a stroll in the park. The presence of multi-linguists took David back to the 1980’s when he worked at Zellik near Brussels on the dividing line between the Flemish and French speaking regions. The managers at the depot came from the more affluent Flemish region and despite being bilingual they spoke in Flemish to the Cleaner who could only speak French. When David entered the depot he said, ‘Bonjour, ca va bien?’ to the Cleaner who was so stunned that a manager had spoken French she didn’t reply. What the Cleaner didn’t know was that David couldn’t speak Flemish and what David didn’t know was that he had made a political gesture. In 1999 when David was undertaking some consultancy work on the use of pallets he telephoned the depot in Zellik for information and before he could explained what he wanted the Receptionist said, ‘You are Mr. Hall, we will never forget you, you were the only manager to speak French to the Cleaner!’ Whilst language was used as a weapon in Belgium it was used in friendship in this part of Wales. The Leyland Beaver was followed by 4 Morris Minor Cars, from the local Vintage Club, which carried the mourners, and then two tractors, as the Deceased was passionate about restoring his own Morris Minors and Tractors. David shook hands with Maldwyn and two of the Brothers at 1500 hours and then set off for home. Coming from a side road onto a main road, David was treated to an aerial display from a pair of Red Kites which were only a matter of feet away. David always seeks to improve his route and coming along the A48 dual carriageway towards the M4 he thought back to his school days and the Maths Teacher who said that the hypotenuse is always less than the sum of the sides on a right angled triangle. So given that it was 1700 hours on a Saturday traffic was light , David, cognisant that the Leyland Beaver was colour blind, he opted to save mileage and tricked the old girl to take the M4 knowing that she would be oblivious to the blue signs. The Leyland Beaver got off the M4 at junction 42, Briton Ferry, took the A48 and David stopped at Kentucky Fried Chicken on the Bridgend Bypass for his supper. David parked the lorry in the Wickes car park, checked it was alright to do so, and whilst he was waiting in the queue he phoned Mission Control 10 minutes after he had stopped. Unfortunately there had just been a fatal accident on the A48 at Cowbridge, some 10 minutes down the road from Bridgend in the Leyland Beaver. David looked at his watch and realised that he had been lucky and this perhaps was the only situation in this world where a Kentucky Fried Chicken Meal had saved someone’s life. David’s wife had found a cunning detour via Barry, but unfortunately this involved a single track road with no passing places with hedges brushing against the cab. David was not best pleased. Shell Castleton was open as the owner had promised, 29 gallons of diesel were added to the 55 gallon tank and Tesco Clubcard points were added, which pleased Mission Control. At 2245 hours David pulled the stop on the Leyland 600 engine and with the Beaver safely in the garage, Mission Control texted Maldwyn, ‘Home Safe’.